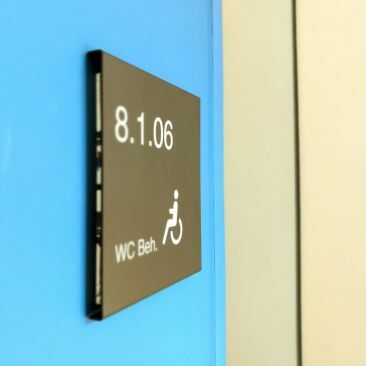 The users of the public areas look at aluminum door signs, the surface of which is anodized in a central bronze color and provided with individual, engraved text. In white color. The transparent acrylic glass wall bracket is almost invisible and makes the signs appear floating on the wall. The internal areas of the building are equipped with acrylic glass door signs. Highly transparent with polished side edges, whose text area is provided with a digital back print. Stainless steel wall brackets optimize the appearance. Silver-colored room numbers and their identification of high-performance film on the upper door leaves are used for internal assignment.